I started out to play without paying bills, but soon the campfire consumed my picnic box, which Forrest used as chair near the fire. I didn't replace it, so he had to eat roasts from the camp fire. I was afraid he might catch himself on fire, and in case the water was turned off by the communal water supplier he would have died. So I went and paid all the bills. Anyway he completed stage 1 using one Youth Potion. 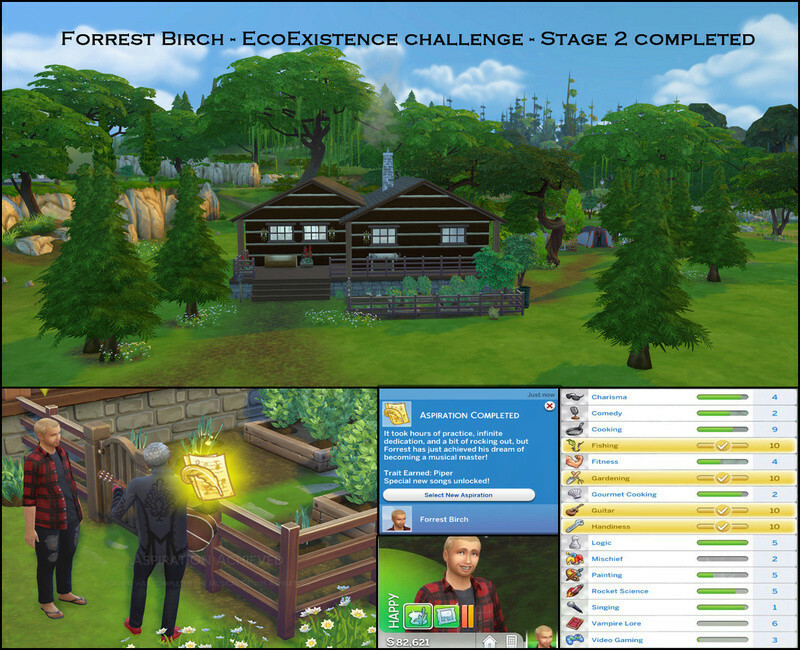 Forrest built a house, using natural material. He incorporated any self made furniture possible. The barstools he swapped to wooden ones of the same type. Since his handiness skill isn't high enough he can't build a tub or toilet. That for the bathroom is still empty, he will continue to use the shower and toilet from the camp site. 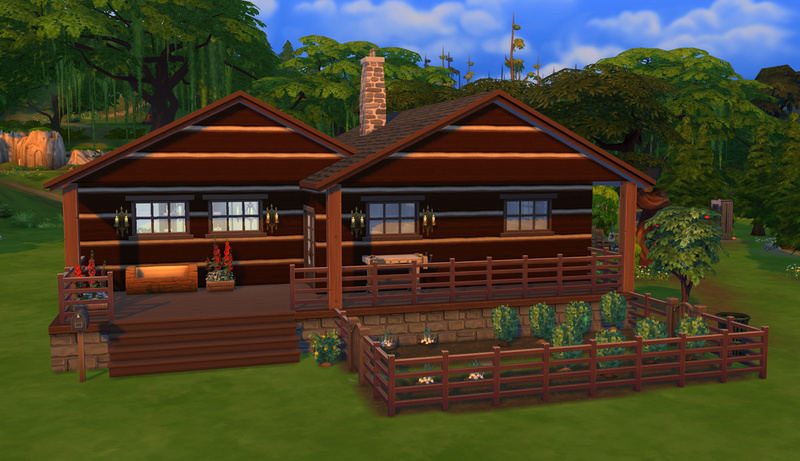 Forrest refrained from using electrical lighting, only the fridge and stove run on electricity. Love that you are sharng your gameplay here. Forrest reminded me of someone and I figured it out. 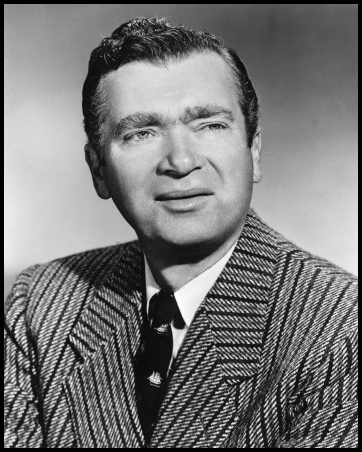 To me he resembles actor Buddy Ebsen Best known (to me) as Jed Clampett in The Beverly Hillbillies and as detective Barnaby Jones as the title character. Oh Yes, I can see the resemblance. Although I have never heard of the actor. Sergio Romero kept inviting Forrest for outings all over the place. And no, he is not the one. 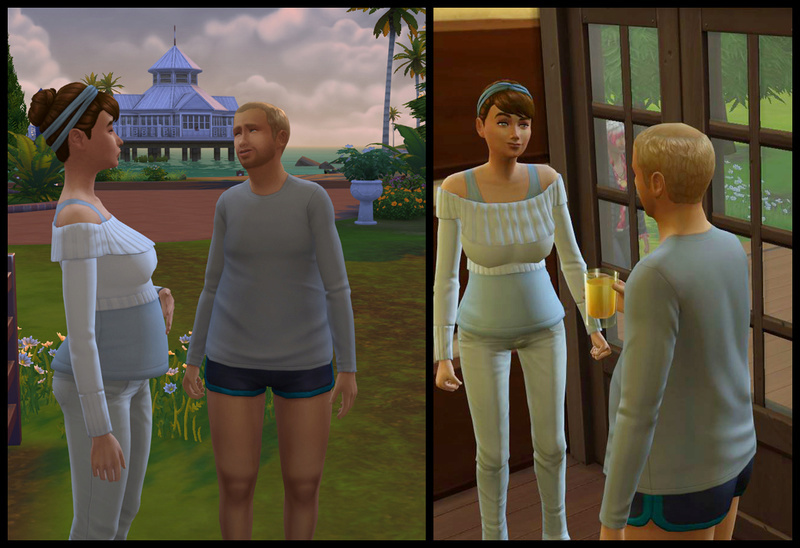 One night at a drinking hole in Windenburg - Alien night! -There was this guy: stunning steel muscle, funny, and super friendly. Archer. He and Forrest talked the whole night long after everyone left. Back home Forrest was plagued with self doubt. 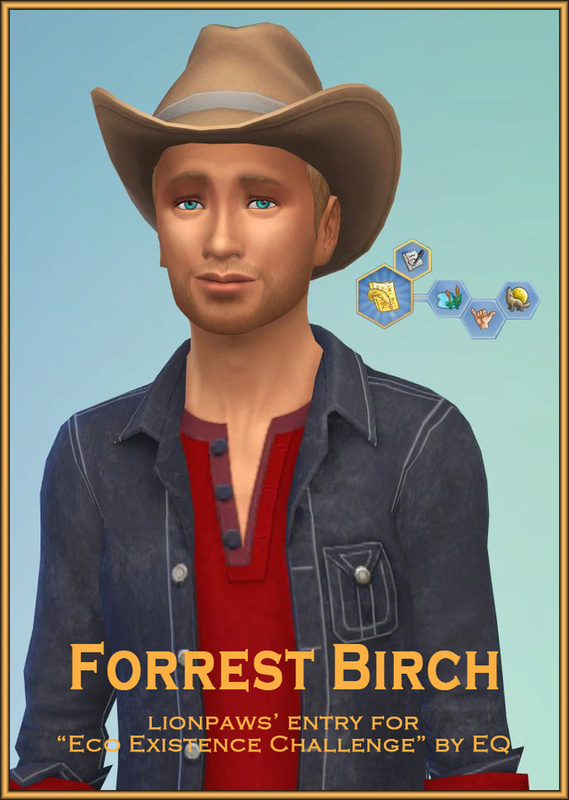 Archer was extremely good looking, fit and totally out of Forrest's league. Probably a one night friendship. Why should a guy like him be interested in Forrest? He knew he wasn't anything pretty. His hair was thinning prematurely and his body was swaying to the soft side. He should probably hit the gym more often. To Forrest's big surprise Archer kept calling, inviting him to events, and to meet his friends. So he got over himself and invited Archer back to his place. With gardening he tried to keep his nerves in check, but all effort was in vain, when the man of his dreams walked into his garden. Archer was gorgeous in his true form, but in his disguise he right down floored Forrest. Who would have thought this alien goodie turned out to be a flamboyant perfectionist. 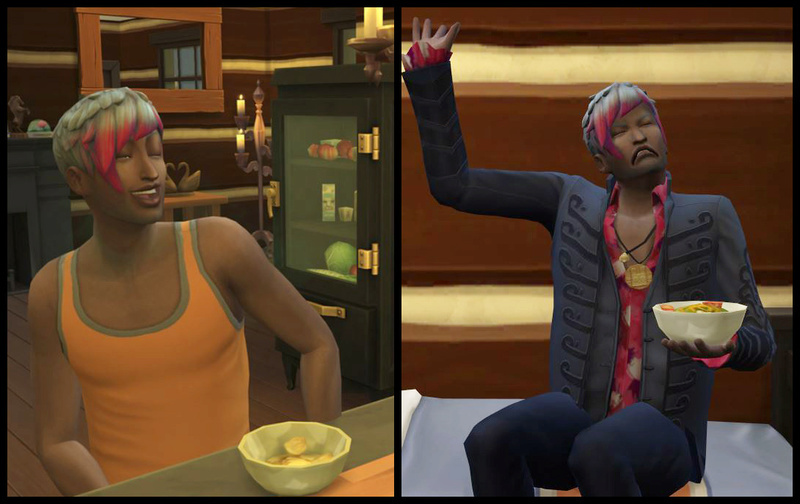 His style is a little crazy (insane trait) but not of bad taste. Forrest fell head over heals. Archer moved in with Forrest. 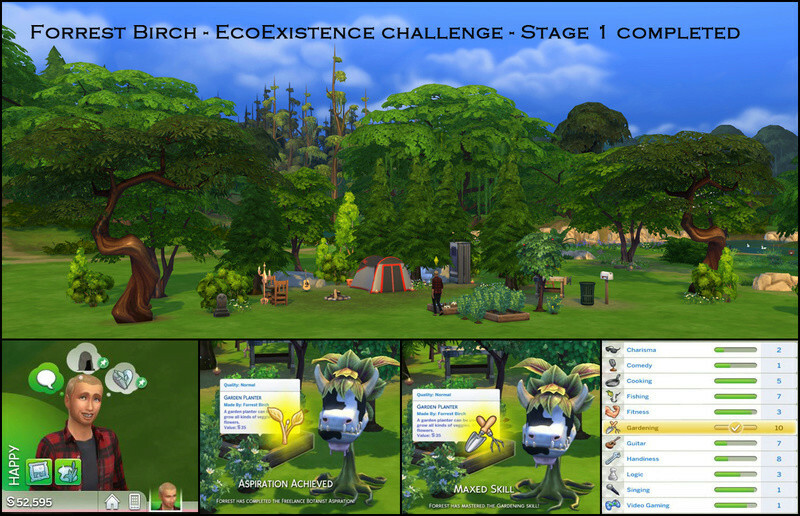 And Forrest is ready to tackle stage 3 of the challenge: carrying over the eco awareness to the next generation. He is a loner and Archer turns out to hate children. This might be a challenge for the couple as well as the player! Well, it will be interesting going forward. 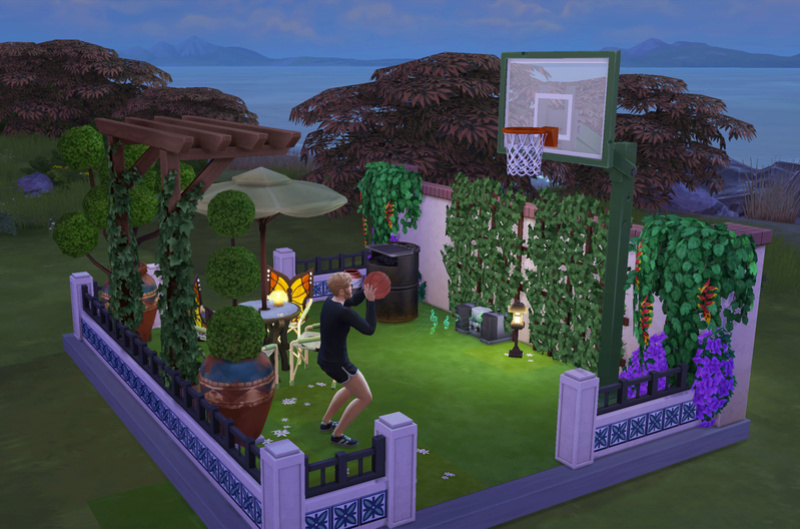 Nobody is perfect, not even the Sims. Thank you Merry for finding this. 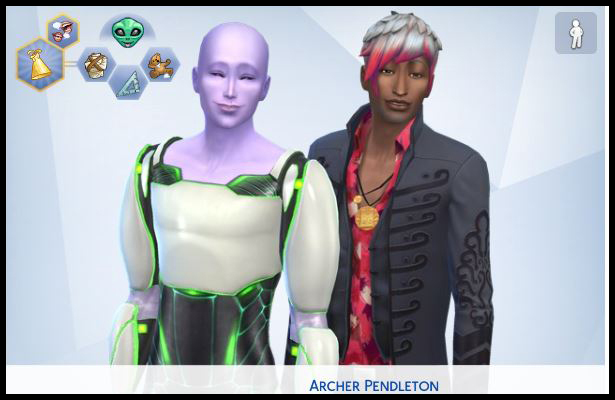 Since this is a gay couple and the only alien abduction I had in this save did result in nothing I'm left with adoption. - How boring! "... you know and there was this huge bornfire in the ancient ruins, and we had a lot of fizz to drink ... and we were all laughing and hugging, although we didn't really know each other ... and somehow I ended up with one guy in the bushes. ... when I woke up the next day I was all alone; nobody was there anymore. ... When I got fatter my fiancé questioned me and found out about that night. ... He told me he didn't want it, if it wasn't his and I should go and find some other place to stay. "I saw you had this beautiful house and a tend in your garden; and I was thinking, maybe I could sleep in that tent until I found a new home?" Forrest told her he wouldn't want her to stay in the tent, but in the house; only he had to ask his partner first. "Hi Love, I'd like you to meet Raven. She is homeless and needs a place to stay." "Welcome Raven to our humble home. But you have to be aware that we don't have electric lighting, a gas powered fridge and stove, and only natural material furniture." "That's awesome! Thank you for having me. And the eco friendly living will be good for my kid!" "She needs a home, Arch. Please?" "Sorry Archer, I'm really happy you let me stay here." "Mmmmh. I'm not thrilled about the aspect of tripping over toys everywhere." he growled. "Eerh ... I wouldn't be either." Raven mumbled. "I think I will give it up for adoption." Love the turn if events. What a great way to add a new family member. 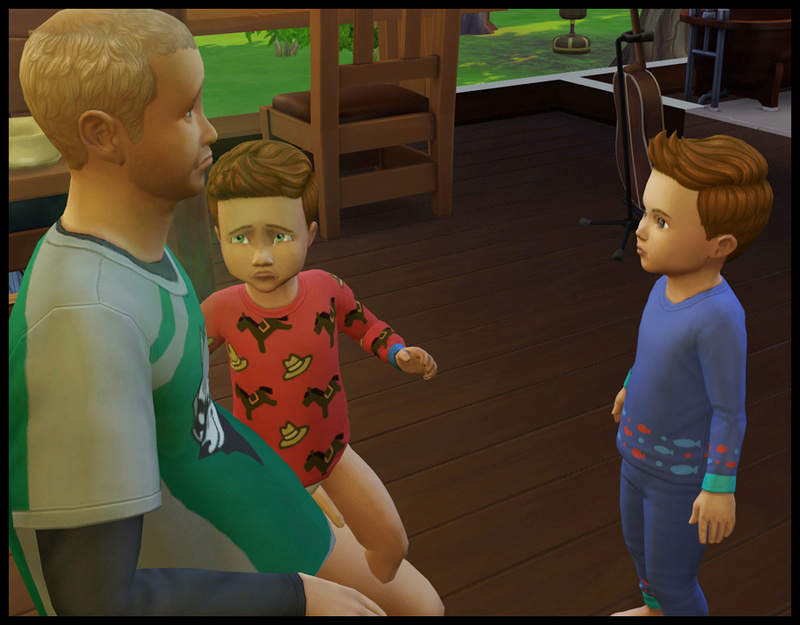 Had to pull put the Parenting tutorial, I never played a toddler in Sims4. Anyway, I dared to continue with Forrest and Archer. Raven started to make herself at home the minute she moved in. Books and half eaten food scattered all over the lot. 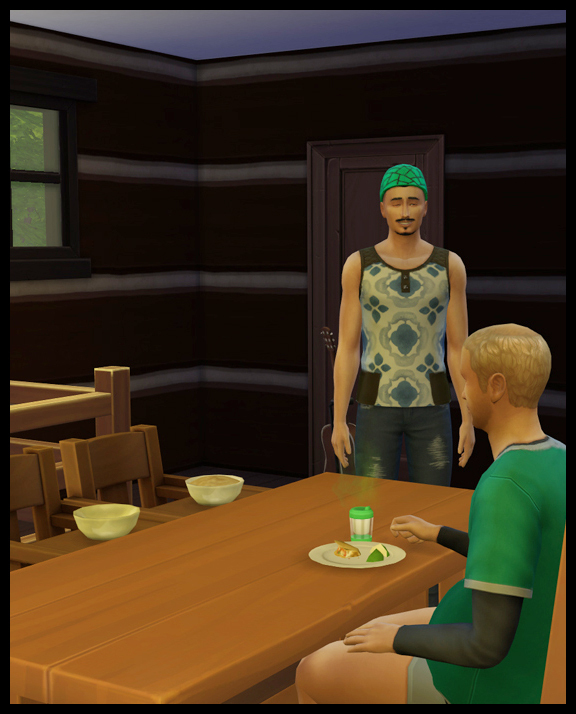 Forrest tried to hide out in the tent, his loner trait giving him trouble. Archer was comforting him the best way he knew. In his alone time Forrest thanked him by building an underground launching platform with a rocket for his alien lover. A suite was added to the house with a bed and bathroom for Raven and her kid to come. Archer had to bite his tongue not to call Raven out for her sloppy ways. But Forrest reminded him that it could be due to her huge pregnant stomach preventing her from moving easily. So the mood wasn't the best in the house when delivery time came. "It's a Boy!" yeay! I rolled Jaden for his first name. But .... No! nononononono NOOOO! WHAT? TWINS? - I wonder what would happen if I exited without saving. Would a repeat result in twins too? - I had to remind myself I didn't want to cheat, sigh! And guess who was the first to take care of the bundles? Our children hating alien! He can do it, I can do it. Now I have to have more study time on that tutorial. see you soon. He is an in-game NPC. I did change his disguise though. Oh boy! 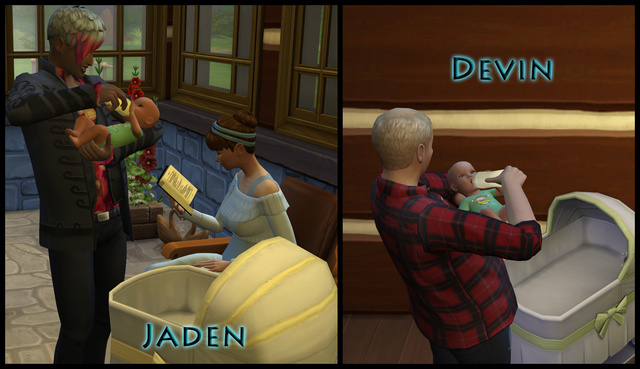 Toddler twins can be a handful! They may want to let her stay to help take care of them, lol. Oh my! They'll be a handful. 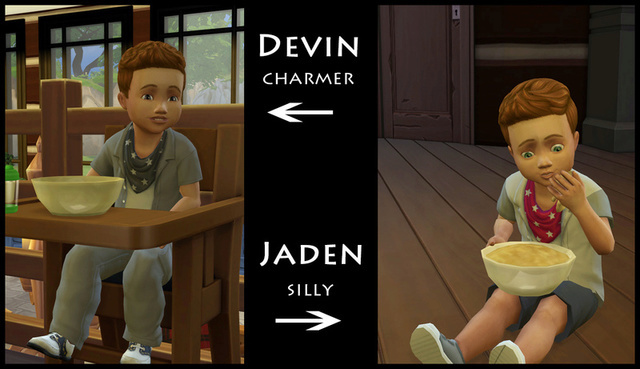 I haven't played toddlers in Sims 4, and probably never will, so I hope you have fun with them. I'm glad to see the 'child hater' has taken a shine to the twins. "Thank you ladies, for your support. I really need it. More than I Archer does. He used to be an ever happy energetic person that always pulled me out of my funk. 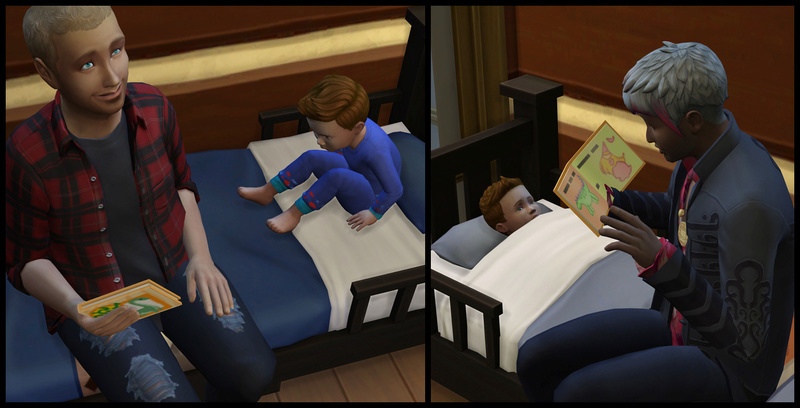 But since the babies aged to toddler it's a rare time I see that old Archer any more. You find happy Archer/toddler pictures here, but that may be the result of the rareness of the moments. I just didn't want to loose them." "See what I looked at meals before and what I find now? It's a sad thing to see. Nowadays he is exhausted, almost always grumpy bordering on stir crazy. And he tries so hard to hide it from the boys." "I think I should introduce you to our boys! "Yes they are ours. we adopted them, their mom is still living with us. She does some minor things around the house, tidying, and watering of the garden. Caring for the boys she often just stands there blocking the way." "Aren't they cute? Player changed the hair color of one of the twins to match and picked silly and charmer based on their mother's traits: self assured - outgoing - cheerful. 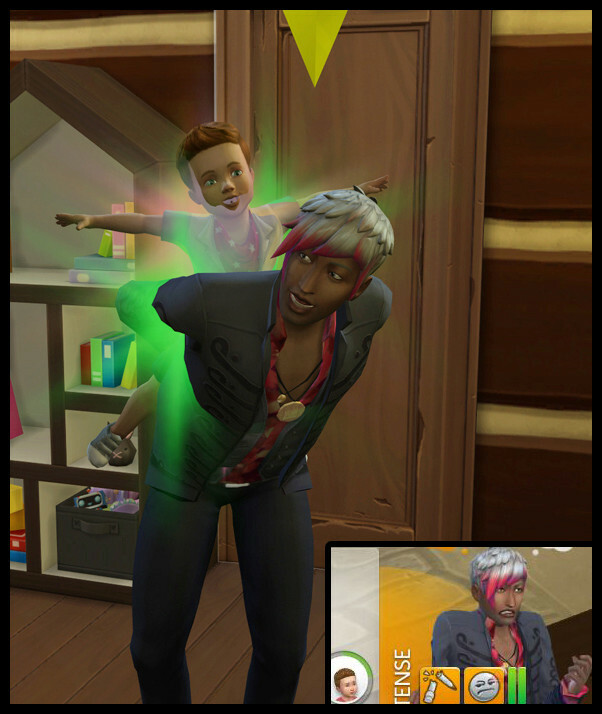 "Player had as much trouble figuring out how to handle the toddlers as we, the brand new parents. The poor things were in the red or blue most of the time." "And not just them! I don't know how we managed, but one of us was always there for them.Although you can see, one for two was not enough most of the time. "We cared for all their basic needs and had a quiet hour every evening, all the four of us." "By the time we finally got a handle on things this guy showed up, demanding he was the father of the boys. We didn't know at first what to think and Raven wouldn't say anything. She just disappeared into the tent. "We found out he really was the father and let him hold his sons, hoping he would be happy now. He wasn't. He never left, always carried one of the toddlers around not being of any help. The boys suffered badly of hunger and sleep deprivation. "I tried Raven to make him move out. She just said she didn't know the man, if we wanted the boys, we had to hex it out with him. "Gordon, that was his name was friendly, carried around one of his sons while neglecting the toddler's needs. He was friendly, but when we asked him about adoption he acted as if he hadn't heard a syllable we said." "We discussed the problem with player and she finally solved the problem with removing Gordon permanently. He never left, always carried one of the toddlers around not being of any help. Great update! I see they, as well as you, are surviving the toddlers, that's good. We discussed the problem with player and she finally solved the problem with removing Gordon permanently. I am sure both Dads will be happier when they grow up. I really hope so. I'm kind of procrastinating to open the save. Just look at those adorable faces. How can you resist? I got a few hours to play and sent Hjalmar from the Zodiac Sims to the jungle. While he travelled he lived in the city, in an historic apartment at the Spice Market. 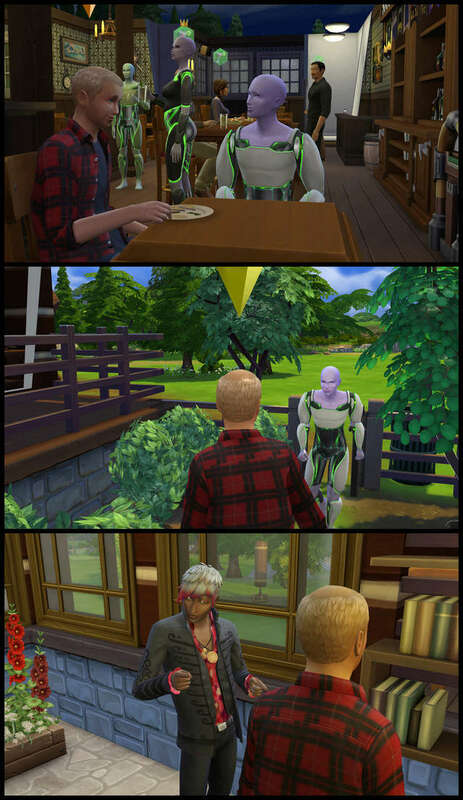 Now I moved him to Windenburg. 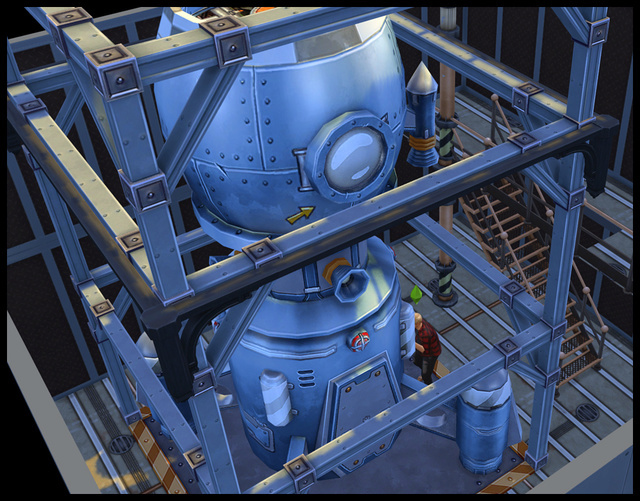 I placed "Shipped Container Starter" by cOgle unfurnished on the Pier Palace lot. And turned it into a two story house with a display room at the bottom. In the back I built a little BBQ room inspired by Hjalmar's travelling.